Last year's Ten for Tuesday post featuring Fire Safety Week Activities remains my most popular post on the blog. This year, I decided to focus a bit more on important fire safety tips for kids and families, in addition to activities. A couple of months ago, a blogger friend of mine who writes at Capri + 3, shared that a local family in the community had recently experienced a house fire. She invited me to join her at the home one day to see the damage first-hand and see what we could do to help the family. I used the visit as a learning opportunity for Wild Thing. Telling him what had happened and how the family had lost all of their books and toys. He selected several books to give to them, including one of his favorite books and a few new books. When I visited the home, the affect was significant. Seeing the damage and learning how quickly the fire spread underscored for me the importance of fire safety and, like the family, I was grateful that their children were not home at the time as the fire started in their son's room and quickly spread through most of the upstairs. Getting photographs that really showed the damage well was a challenge because the rooms were so dark, and because the experience was so overwhelming. 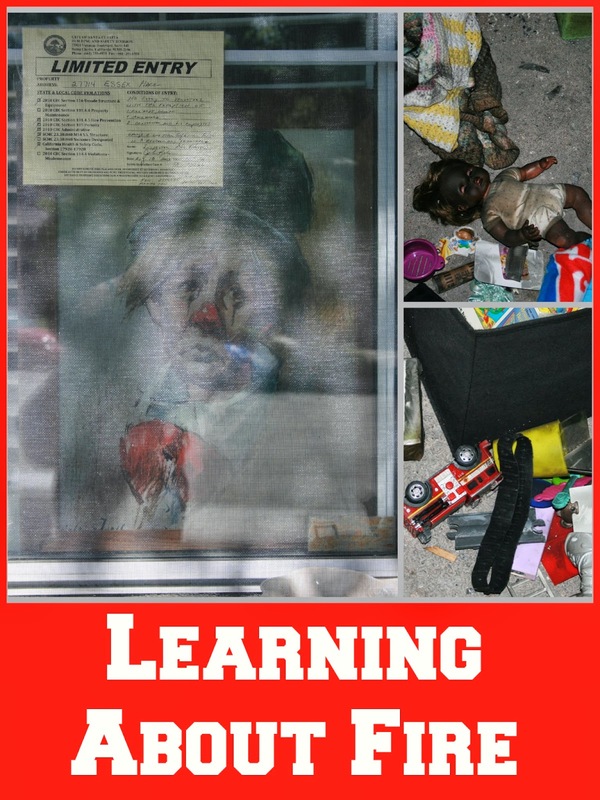 These few photos were images that stuck out for me -- the doll and afghan were family heirlooms that the mother had played with when she was little (her grandmother made the afghan) and the firetruck among the debris stood out for me as did the painting of the crying clown. 1. Play Safely - Make sure kids know not to play with matches and lighters. The importance of this must be stressed with kids. 2. Don't Hide - Children need to know that it is very important not to hide from the fire or firefighters and that getting outside is critical. Kids will tend to hide under beds or in closets especially if they may have started the fire. And don't hide from us. We always have a FF meet the kids in uniform and then put all the gear on. We encourage them to give us high fives while dressed out because we do look and sound scary. Lots of kids won't come near us. 3. Stay Low, Practice Crawling - When getting out of the house, tell kids they need to crawl. This way they will stay below the smoke. Practice crawling. If you have to crawl down stairs turn around and go feet first. Always feel doors for heat before opening them. If your escape route is blocked by fire, shut the door to whatever room you are in and go to the window. 4. Stop, Drop and Roll - Of course, if your clothes catch on fire, Stop, Drop and Roll. Demonstrate what that means. We have classrooms full of kids rolling around on the floor. 5. Get Out of the House/Leave Toys Behind - Make sure the kids know that the most important thing to do is get out of the house. Don't try to put the fire out or grab toys. 6. Call 911 once you are outside. - The instinct might be to call first, but it is important to get out of the house/away from the fire first. 7. Have a Plan - For parents and kids together, work out an escape plan. Draw a map of the house and yard. Have a meeting place outside at a fixed location. A tree or a mailbox. Mark it on the drawing. Show escape routes. Have more than one. If the child's room is on the second floor, get an escape ladder and make sure they know how to use it. And use it only if you can't get out through the house. Make sure there is no furniture blocking access to windows and doors and make sure all windows open easily. 8. Practice Your Plan - Once the family has the plan made up, hold fire drills. Maybe do drills once every few months or at least when you change your smoke detector batteries. Hold the drills at night because that is when the majority of fires occur. Make sure everyone in the family is on the same page about what to do in the event of a fire. 9. Have Working Smoke Detectors - And for the parents because it is so important: Have WORKING smoke detectors and leave them up! Smoke detectors do save lives. I live in a 1000 sq ft house and have 4! Change the batteries when you change your clocks. 10. Shut the Doors - I shut every door in my house when I'm not home. I appreciate the tips she shared. I saw the value of this last tip first-hand. When I visited the Winger home, the fire spread so quickly through many of the upstairs rooms, but did not damage the parent's room because their door had been shut. Oh - and here's another tip that my firefighter friend's 5 year-old godson reminded her to share: when you feel a door to see if it is hot use the back of your hand. She also shared these videos for kids too: Be Cool About Fire Safety Part 1 and Part 2. 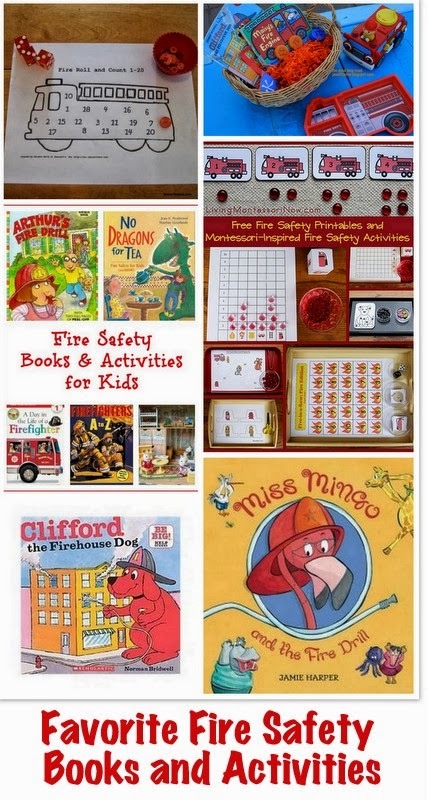 Doing fire related crafts, activities and reading fire safety books or books about fire trucks and firefighters, are great ways to engage children in learning about fire safety. Here are some top book lists and activities from fellow bloggers that I love -- and a few of our own. 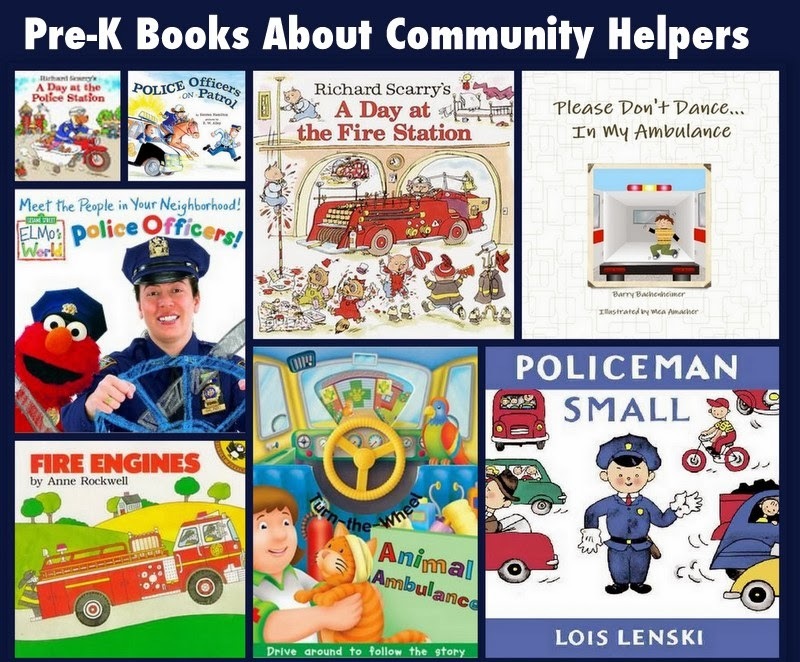 KC Edventures recently shared Fun Ways for Kids to Learn Fire Safety featuring helpful books and activities. Plus, the post features a link-up focused on community helpers. 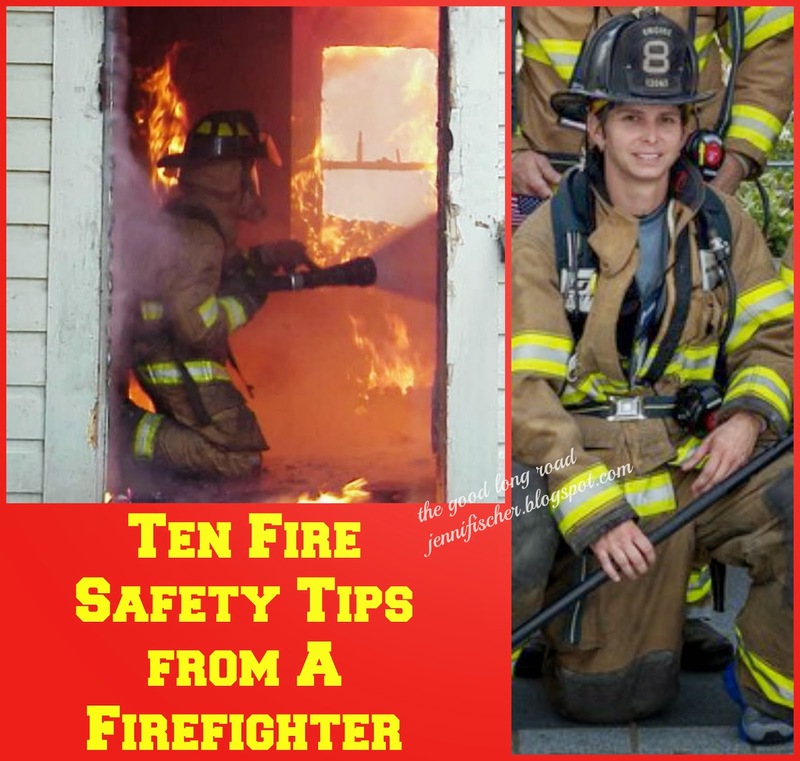 JDaniel4's Mom has a weekly Read.Explore.Learn series that I love and this week she featured Fire Safety Books and Activities. Crafty Moms Share caught my eye because she featured the book Miss Mingo and the Fire Drill, which I will have to request from our library since the boys love Miss Mingo and the First Day of School. She also provides useful links for fire safety resources. 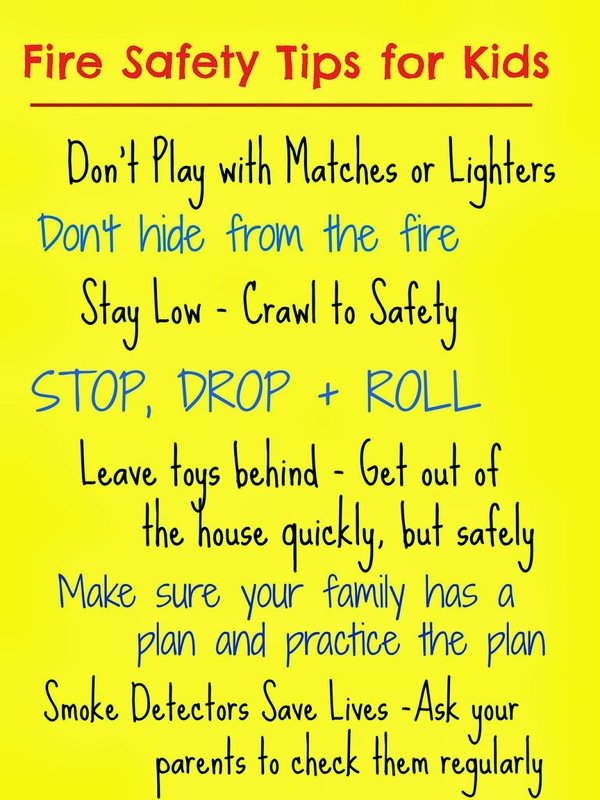 I also love Living Montessori Now's Free Printables and Montessori-Inspired Fire Safety Activities Round-Up. Finally, No Time for Flash Cards also has several fabulous fire truck activities. I put out our Fire Safety Sensory Bin again this year adjusting it a bit by adding a couple of books to the bin and incorporating reading and learning as we explored the bin, which timed out well because we're also focusing on the letter F right now at home. Wild Thing loves Clifford books, and I've found that Clifford The Firehouse Dog is a great book for discussing fire safety. Wild Thing also enjoys tracing right now, so he traced his fire truck plate as well. I can tell he's learning fire safety at school, and I encourage him to share with me what he is learning to further reinforce fire safety for him. Caterpillar adding water to the fire truck that Wild Thing traced. You'll find many more Fire Safety Activities, including fun DIY Fire Fighter Costumes, ABC Firefighter Play and much more on my Things That Go Pinboard! I also put together this quick safety tip list for our family. Sharing at: Share It Saturday, The Sunday Showcase, Discover and Explore Community Helpers Linky, The Sunday Parenting Party, Crafty Moms Share, Link and Learn, After-School Linky Party, Montessori Monday, Tuesday Tots, Mom's Library, and It's Playtime! Find more activities/posts about Fire Safety For Kids. Bonus Share for 2014: Fire Safety For Kids! Thank you for the mention!! I hope you will stop by and share at Sharing Saturday too!! Thanks for sharing these important safety tips! I hadn't heard the back of hand trick - that's a good one! This is a wonderful post! 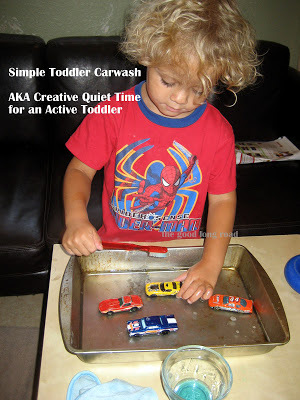 I love the tips and will be going over them with my son. These are great tips. I am so sorry about the family that lost everything in the fire, thankfully they are safe! What a great resource for parents! I struggle sometimes with how to share these tips with my kids without scaring them. I know I need to make it a priority. Thanks for sharing at After School! I must say that these tips can save lives. I want to spread these information about fire safety to as much people as I can using blogs, articles, social media. Thank you for sharing them here. Thanks for these ideas, I'm doing fire safety with my preschool class and these have really helped! Before all of you think about this, my child never played with fire, had a fascination with fire or played with a lighter or matches. Not two days after his fire safety training from our local fire department, my son became fascinated. He stole a lighter and lit several things on fire. So rethink what you are teaching and whom you are teaching it to. 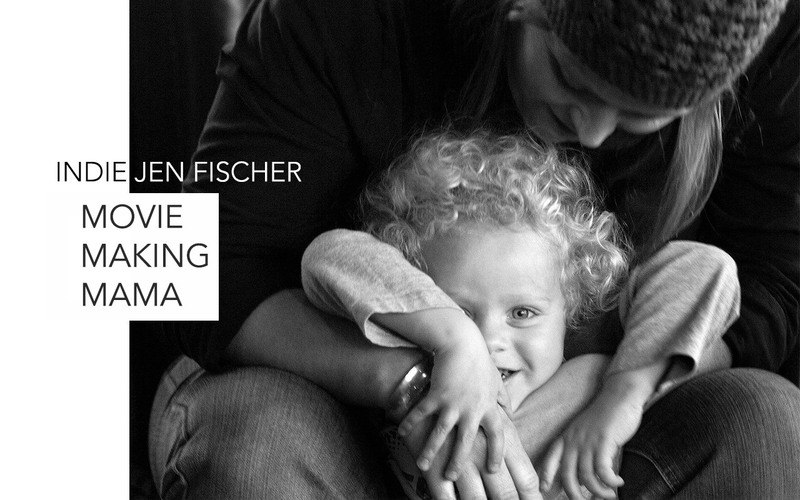 A kid with reactive attachment disorder, a kid with ADHD, or oppositional defiance disorder, you have just given the so many ideas on what they can do to act out. Public schools insisted that we mainstream kids with behavioral issues but really you have just given them permission to bully, showed them how fire works, and caused an entire family to live in fear. Schools need to get back to the 3 R's and quit playing parent and a one size fits all approach to teaching. The law says I have to send my child to school but as parents we have little control on what they are teaching. If I had been ask if I thought a fire safety class would have been good for my son, my answer before he had and after would have been hell no. Erin, how many lives has your fire safety class saved since it has "really helped"? Are you so disrespectful of your student parents that you think they are so ignorant that your job is to teach this because they are incapable of teaching them the dangers of fire?